Welch Allyn presents a high-quality blood pressure monitor for veterinarians with its DuraShock Gold Line DS 66. After many years of underestimating blood pressure monitoring in veterinary medicine, it is now apparent that common illnesses in animals are accompanied by high blood pressure, thanks to improved monitoring techniques. Regular blood pressure monitoring helps to diagnose illnesses early. The DuraShock Gold Line DS66 manual blood pressure monitor is now available as a model with a pressure relief valve instead of a screw-on valve, and has a Soft Comfort grip. 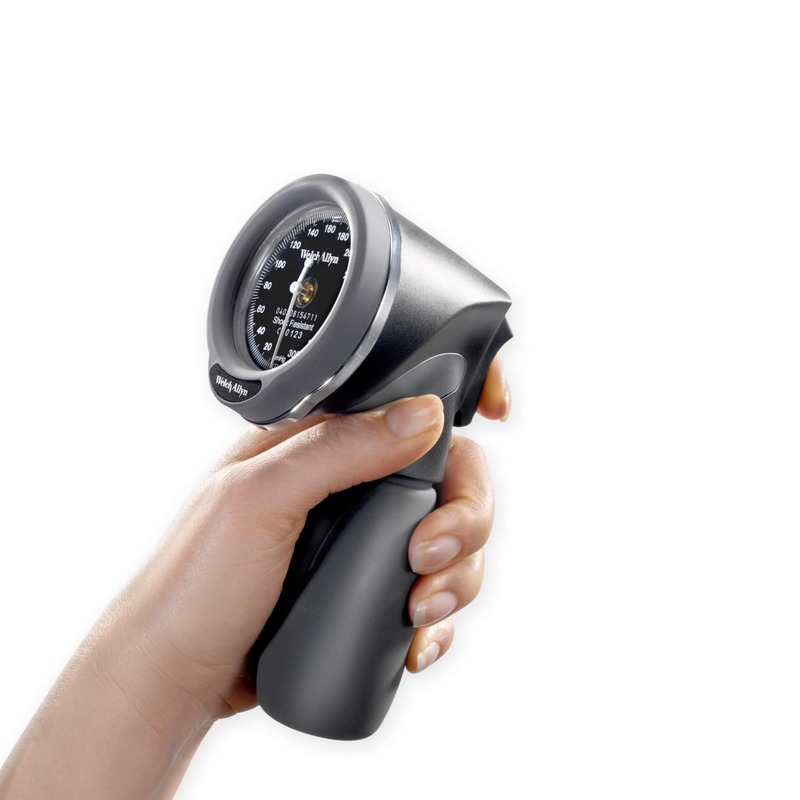 The manual blood pressure monitor from Welch Allyn's Gold Line has a laser-engraved dial for even more precise reading. In traditional blood pressure monitors, the movement of the expansion chamber is transformed into a circular motion by small cogwheels, levers, and springs. The transmission-less new manual blood pressure monitor with DuraShock technology uses a single spiral spring to transform the movement of the expansion chamber directly into a circular motion of the pointer without using a susceptible mechanical system in the process. The GoldLine DS66 manual blood pressure monitor is supplied with a tri-purpose tube and a black case. Please note that the blood pressure monitor comes without an inflatable cuff. Can this blood pressure monitor be used on all animals? No. In theory, blood pressure monitoring is possible with all animals - this depends on the device, however. The GoldLine DS 66 blood pressure monitor, along with the separately available blood pressure cuffs, is suitable for all animals between the sizes of a medium-sized dog and a horse. The blood pressure monitor can also be used on cats and small dogs - however, there is the possibility that the signals from the animal required for the auscultatory reading aren't strong enough to record a value. It displays the oscillatory measurement. How does this blood pressure monitor measure blood pressure? 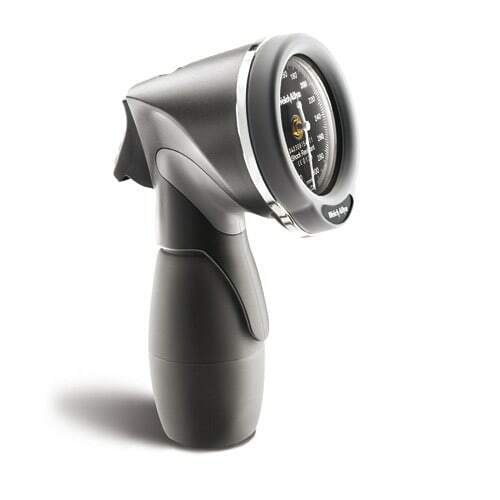 Blood pressure is measured by auscultation with this monitor. That means that Korotkoff sounds are monitored via a flat stethoscope beneath the inflatable cuff and recorded as a systolic/diastolic value. Is this blood pressure monitor suitable for veterinary medicine? Thanks to the DuraShock technology, this device is very well-suited to use with all auscultatory blood pressure monitors. This new technology replaces a fragile internal mechanism and ensures that the device remains calibrated, even after a fall from 75 cm. In veterinary medicine, apparatus need to be robust - the GoldLine DS 66 blood pressure monitor readily meets this requirement. The DS 66 also offers a 15-year manufacturer's warranty, one-handed operation and a high-quality, ergonomic design!